When I was in the Philippines the left button of my touch pad on my laptop died, so I ordered the part online. I've been putting off dissecting my laptop for more than a month now and it's a 3 day weekend so it was time... I was getting tired of using a mouse. In order to replace the touch pad the entire front cover palm rest had to be removed. Which meant I had to take out my cd/dvd drive, remove my keyboard and take off the LCD Display... fun.... I just love dissecting my laptop, lol. 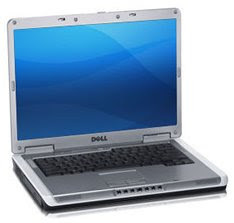 I'm always so grateful Dell has the service manual published online. It took about 40 minutes to remove and replace everything. And there was 3 years of dust, dirt and grime once the palm rest was removed... wow... yuck! I cleaned that out before replacing everything. So now I have my touch pad back. My co-worker joked with me and said if I keep replacing parts I'm just going to have a whole new laptop eventually, haha! My laptop is nearly 3 years old now.... I bought it back in May of 2006. I love it, because I got to customize it online when I purchased it. I like alot of simulation type games, mainly the The Sims 2, The Sims, Sim City 4, Roller Coaster Tycoon Series, etc. I also create alot of web graphics with Macromedia Fireworks. So I really wanted a system that could handle those types of programs. My laptop has a 2.0GHz Intel Core Duo Processor, 2GB of RAM, 100GB hard drive, 256MB ATI Radeon video card. Plus it has a really nice 15.4 wide screen display. I paid the extra money for the 2.0GHz processor because that's the most important part of a computer. I wanted a laptop that could perform like a desktop. My #1 rule for buying a computer is to make sure you have at least a 2.0GHz processor or better, #2 would be your RAM (at least 1GB or more. ), #3 video card (at least 256MB or more. ), #4 hard drive size, etc. It really depends on what you want to use your system for. If you want your computer to run fast & smooth, the processor speed is what you should look for first in a system.